I know I posted this a few days ago, but here is a description along with what you can win. The link for Southern’s Girl’s giveaway, will be at the bottom of this post. Once Upon a Time there was a blogger who loved Fairy Tales. In fact, she loved them so much, she decided to dedicate an entire week to the celebration of all things Fairy Tale! 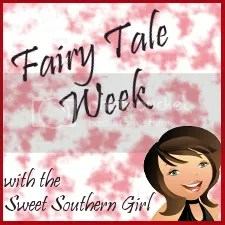 I don’t even remember now why I decided that Fairy Tale Week was happening here at Secrets of a Sweet Southern Girl, but I’m so excited that it’s here! That’s right! Plural! I’m so excited about the items up for grabs. It’s not too late to get in if you want to sponsor a giveaway item! This is a chance to share all of your favorite movies and shows that are Fairy Tale inspired, or talk about your favorite Disney Movies, whatever floats your boat. I’m not having my own link-up. I’ll be linking with Michelle for Oh How Pinteresting, but it will be Fairy Tale ‘pinspired’. I hope other people do the same. I’m going to be reviewing some of my favorite Fairy Tale inspired books. Have some of your own? Join me! Outfit of the day anyone? Create an outfit that reflects your favorite Fairy Tale Character and link-up! Shh.. it’s going to be scandalous! I’ll announce the winners of the giveaways on Sunday to wrap-up the week! Sara at Pink Clay Monkey is sponsoring these giveaways with me. One of my favorite Fairy Tale shows is ABC’s Once Upon a Time. So when I found this necklace on Etsy, I thought I would die! I simply had to have it, and when I say that the detail and quality is amazing, I’m not kidding. Sara works with Polymer Clay to fashion unique charms that are just out of this world! I love my necklace! I can’t wait to get some of her adorable Starbucks Christmas Earrings! 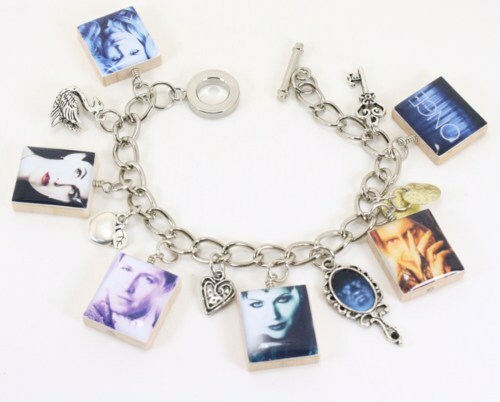 She has a lot of awesome things in her shop including these Once Upon a Time Charms. Sara has been so great to offer three prizes to my readers this week! Here is what is up for grabs.